On Sunday 18th October we will be celebrating our Harvest Festival. Living in the city we can easily be cut off from the cycle of nature and the abundance of God’s provision for us. However, in Thailand we just have to look out the window to see the fruits of nature all around. This year Warren has invited us to celebrate the harvest at his place, Thung Dong Farm. There will be no service at All Saints on that day, instead we will leave the church at 9:30 a.m. and spend the whole day at the farm. Our service will begin around 11:30 a.m. and we will share lunch together—which Warren has kindly provided. We should arrive back at church around 5 p.m. You can see more pictures and information about the farm at www.thungdongfarmstay.com It looks like a beautiful place! If you intend to go, please sign up as we need to organise transportation for everyone! It should be a memorable day. Meanwhile, this week our readings are Esther 7:1-6, 9-10, James 5:13-20, and Mark 9:38-50, and we will be singing the hymns Let all the world in every corner sing, O Lord make haste to hear my cry, Break Thou the bread of life,and What a friend we have in Jesus! The readings can be found via this link! Our sermon is entitled What’s the point in praying? Your choice of 9:15 a.m. and 11 a.m.! We had two great services last week with the launch of our new 9:15 a.m. service, and all is now prepared for this coming Sunday! Our Church Council Meeting followed the 11 a.m. service and lasted about two hours. The meeting was told that things are going well at All Saints, and we see continued steady growth in members, and have a healthy financial situation. The Council also appointed a sub-committee to produce a draft church constitution. This will be brought to the next council meeting for consideration and will then be submitted to a general church meeting for approval. 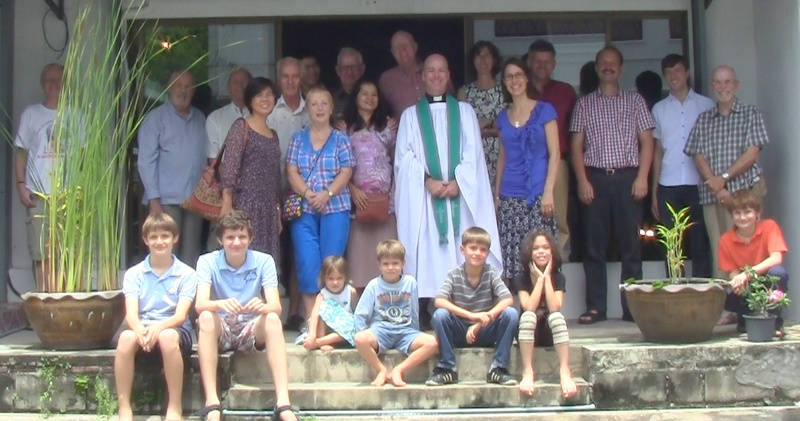 Future events agreed upon include a Harvest Festival to be held at Thung Dong Farm, probably on the Sunday 19th October, a Thanksgiving Potluck on Sunday 29th November, and a Service of Nine Lessons and Carols on Saturday 12th December to be held in Prince Royal College Chapel at 7pm. We will again have a Midnight Mass on Christmas Eve, and a Christmas Morning Service followed by lunch. Spending was agreed for the completion of the organ project, and the possible installation of an air-conditioning unit in the church office to provide a place for younger children during part of our worship. Full minutes of the meeting will be available on request. Finally, a reminder that tomorrow night Michael Aldman will be appearing in Stories for Peace Day as part of the Miscast Players of Chiang Mai. It begins at 7:30pm in the AUA Auditorium. All are welcome to attend and tickets are not required. This week’s bible readings encourage us to be united as the Body of Christ, putting others first, and our sermon will be entitled Bind us Together Lord! The readings are Wisdom of Solomon 1:16-2:1, 12-22, James 3:13-4:3, 7-8, and Mark 9:30-37, and we will be singing the hymns Praise My Soul the King of Heaven, Jesu Jesu Fill us with your Love, Dear Lord and Father of Mankind, and Let us build a house! The readings can be found via this link! The People of All Saints! It was great to see thirty people gathered for our final combined 11 a.m. service and potluck last Sunday. Thanks to all who brought such delicious food to share! This week we will have two services: our usual Eucharist at 11 a.m. and an identical 9:15 a.m. Eucharist. 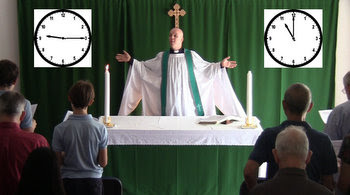 You will now have a choice of worship times – but nobody needs to come twice, except me! After the 11 a.m. service there will be a Church Council Meeting which should begin around 12:30 p.m. Lunch will be provided. This week our Bible readings look at God personified as Wisdom in the Old Testament and Apocrypha, and our Gospel reading includes Peter’s declaration to Jesus: “You are the Christ, the Son of the Living God!” We will be looking at how we see God, as we are made in God’s image: male and female. Our readings will be Wisdom of Solomon 7:26-81, James 3:1-12, and Mark 8:27-38, and we will be singing the hymns The King of Love my Shepherd is, Mothering God, Be Thou my Vision, and O God our Help in Ages Past. The readings can be found via this link! If you enjoy gardening and are free this Saturday from 10am to 4pm, then you can go down to the Foreign Cemetery on the Lamphun Road and help with their exciting renovation project. Bring any tools you have. More details can be found on the Friends of the Foreign Cemetery Facebook page. Also, next Friday, one of our church members, Michael Aldman will be appearing in Stories for Peace Day as part of the Miscast Players of Chiang Mai. This will be on 18th September at 7:30pm in the AUA Auditorium. All are welcome to attend – see Michael for details!